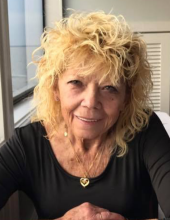 Elizabeth Jane Hart, 62, of Lucedale, MS, passed away on Sunday, April 7, 2019 in Hattiesburg, MS. Elizabeth was born on August 08, 1956 in Pueblo, CO to the late Robert and Imogene Hastings. She was passionate about traveling, her family, definitely her kitty’s and life itself. Elizabeth was preceded in death by her parents. She is survived by her husband, Steven Hart; daughter, Mandy (Jeff) Roberts; son, Steven (Rachel) Osborne; grandchildren, Taylor Roberts, Brittany Osborne, Shelby Osborne, Brandan Osborne, Jacob Osborne, Lucie Osborne, and Patty Osborne; great grand children, Annabelle Mcrae, Jackson Mcrae, and Darrin Skinner; siblings, Nellie Harris, Bob Hastings, Virginia Doyle, Sally Hastings, Alfred Hastings, Laura Hastings, Perry Hastings and Paul Hastings; along with numerous loved ones including cousins, nieces and nephews and close friends that were like family. To send flowers or a remembrance gift to the family of Elizabeth Jane Hart, please visit our Tribute Store. "Email Address" would like to share the life celebration of Elizabeth Jane Hart. Click on the "link" to go to share a favorite memory or leave a condolence message for the family.